The woodcuts, linoleum prints, mixed media drawings and photographs in Marilyn Anderson’s exhibit Guardians of the Arts: Prints of Guatemalan Artists and Artisans / Guardianes de las artes: grabados de artistas y artesanos de Guatemala show Maya and other Guatemalan artisans using their hands to produce different arts and crafts. They include textile artisans producing cloth on back strap and floor looms as well as nets, bags and hammocks with various fibers. 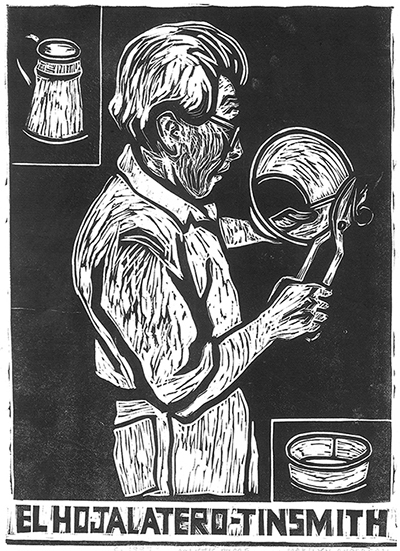 Other prints and photos show pottery making, leather craft, blacksmithing, tinsmithing, jewelry fabrication and more. The artisanal traditions of Guatemala continue to have a vital and unique place in the lives of people there and they affect many others throughout the world as well. These hand made articles connect us to their makers in ways that promote understanding and empathy. But with globalization, free trade, and modernization, many of these crafts are changing rapidly, while others are in danger of disappearing. Yet there is hope for the future of arts and crafts in Guatemala in part because of the Fair Trade movement and because among Maya people, there is a will to maintain them as “living” arts and a heightened consciousness that these traditions constitute an irreplaceable heritage. The exhibit prints and the book (bilingual English /Spanish) are the product all her previous years of residence, research and documentation. More than ten years went into the making of both. The book describes techniques, treats the various uses of the crafts along with history of them and their place in today’s world. Five short essays provide further context. Anderson’s goal for both is to graphically celebrate Guatemalan arts and crafts traditions and the artists themselves.